The most striking aspect of the DualShock 4 is how much better the controller feels while still remaining instantly familiar when compared visually to the DualShock 3. The biggest change with the DualShock 4 is the controllers new handles. They are thicker and more spread a part for an easier and more ergonomic grip. The handles are also slightly textured which gives the controller a very confortable and premium non-slip feel, great for anyone who suffers from sweaty palms. 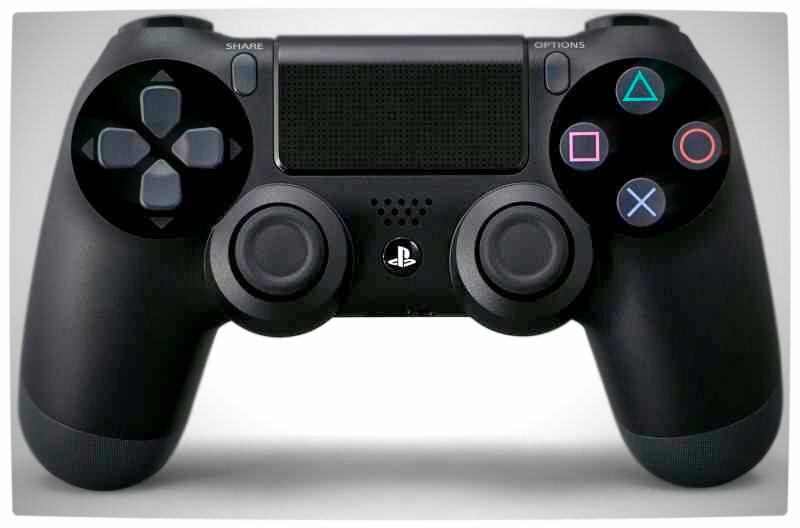 Like DualShock controllers of the past, the new iteration has the same iconic Square, Triangle, Circle and X pad to the right and a very similar directional pad to the left. As a such, the controller is immediately recognisable as a PlayStation controller. The DualShock 4 features newly designed L2 and R2 triggers which contour nicely to forefingers and have a great springy feel. The L1 and R1 buttons retain their trademark clicks. Like the DualShock 3, the DualShock 4 has the same analogue stick layout, but this time Sony made good use of the new controllers broader size and spaced out the sticks a bit more. Although, in my opinion, the placement of analogue sticks is still not as comfortable as on Xbox controllers, the new change is a welcome improvement. Similar to the Xbox One controller, the new analogue sticks on the DualShock 4 feature a concave surface to help withstand slippery thumbs. Instead of the Start and Select buttons that have been a staple on PlayStation controllers since 1994, the DualShock 4 now features Share and Option buttons. Unfortunately, because of the controller’s new touch pad surface, the placement of these buttons is a little awkward to reach. I can foresee that this may cause complications for some users, especially those with smaller hands. 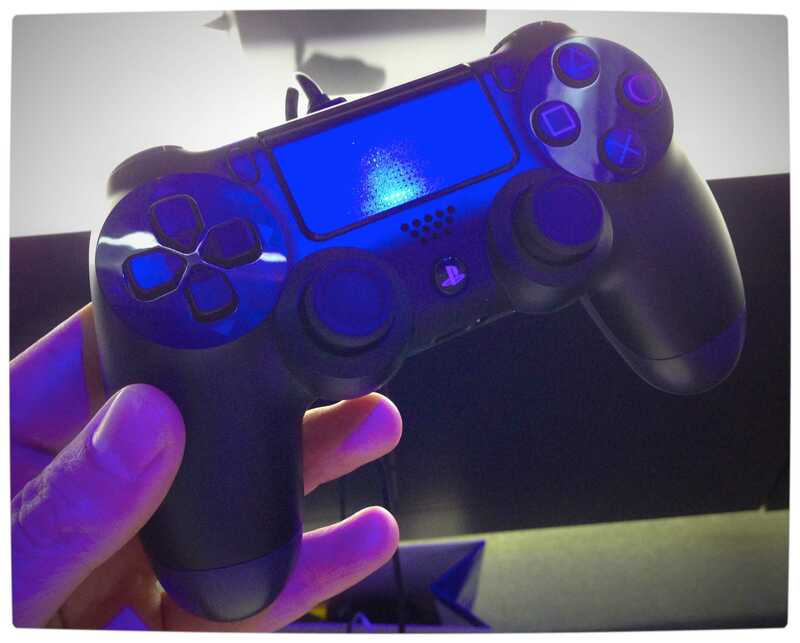 The biggest change with the DualShock 4 is the inclusion of a touchpad in the center of the controller. The pad is reminiscent of the touch pad that features on the back of the PlayStation Vita and even has the same Square, Triangle, Circle and X embossed texture. The touch pad is also clickable, much like a trackpad on a laptop. Sony has also incorporated the same lightbar technology from the PlayStation Move controllers into the Dualshock 4. Doing so allows the PlayStation Eye to identify users of controllers. I was able to demo the lightbar using a new title from Sony called The Playroom. 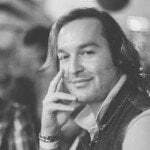 The feature works well and is similar to the way in which the Xbox One controller uses both invisible reflective technology and LEDs to communicate with the console and Kinect. Unfortunately, I was not able to try out any titles that made use of the DualShock 4’s new touch pad or integrated speaker. These new features, I presume, will be made available for testing at a later date. Overall the new DualShock is a welcome improvement over past Sony PlayStation controllers and will make PlayStation fans very happy.